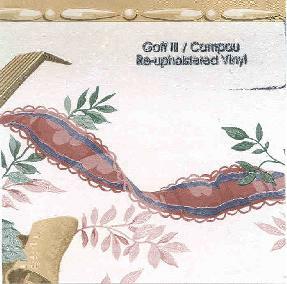 Charles Rice Goff III & Don Campau - "Re-upholstered Vinyl"
Ok kiddies, here's a collection of old songs that don't get covered every day. We've got Charles Rice Goff III and Don Campau giving their own no holds barred interpretations of tunes by some of your favorite artists, as well as a couple that probably appeared on a hundred K-Tell classics compilations. I couldn't start at the beginning of the CD because as soon as I saw they'd covered Eric Burdon's "Sky Pilot" I shot straight to track 3. I've always loved this song. And sure enough Charles and Don do it justice, cranking out a very cool rock n roll version, complete with firing gun and airplane efx and general freakiness. Ok... now I can start from the beginning of the CD. The set opens with a cover of David Bowie's "Kooks". I was a little confused at first because I didn't recognize the title and they begin with the riff from "Rebel Rebel" and Charles does a brief line from "Heroes" at the end. But the lyrics sounded familiar and a quick Google search revealed that it's from Hunky Dory. Next we travel to K-Tel Classics land with a dark and acidic rendition of "The Night The Lights Went Out In Georgia". I don't know if Vicki Lawrence would be flattered, but these guys get a thumbs up for totally making this song their own. If yer gonna do a cover... make it your own. Go crazy. Be weird. Slaughter it... but do it with love. "Shipbuilding" is credited as being written by Elvis Costello for Robert Wyatt. I've never heard it but if anyone deserves to have stars writing songs for them it's Robert Wyatt. Sing it Charles! Another song I'm not familiar with is "My Dark Hour" credited to the Steve Miller Band. But Miller was around long before his dinosauric hit single days and the song has a very nice pop-psych sound. One song I know very well but may not have identified without the chorus is the cover of Peter Gabriel's "Mother Of Violence". It's got a strange but very cool off-kilter Caribbean groove to it. Donovan's "Epistle To Dippy" is given appropriate psychedelic salad shooter treatment. Freeeeeeaky!!! "Acoustic Guitar" is credited to David Byrne/Talking Heads, and definitely has a Talking Heads rhythmic pulse. One of the most head boppin' songs of the set. Charles and Don dig deep into pop music's past for their cover of Gerry and the Pacemakers' "Don't Let The Sun Catch You Cryin'", their cover being somewhat faithful to the original, but coloring it with all sorts of messed up alien bits. One of my favorites of the set. Finally, we get a rousing version of The Fugs' "Kill For Peace". A truly fun set of covers.